The client is a major manufacturer of electrical generators and alternators with a world wide customer base. They needed a special silencer configuration to meet a critical acoustic criteria on nine (9) outdoor electric power generation sites. However, due to internal flow characteristics, aerodynamic losses had to be minimized to maintain requisite cooling air volume flow. The client approached ASI Aeroacoustics with a difficult aeroacoustic criteria and an even tougher delivery schedule commencing in just two (2) weeks! Utilizing our massive aeroacoustic database, a complete hybrid silencer assembly was computer simulated with high speed acoustic iteration, aerodynamically computer modeled by computational fluid dynamics (CFD) and shop ready approval drawings generated in just a few hours. Drawing approval was expedited and the delivery schedule met for the first production test set. Pictured above is one view of the 11.4 megawatt hybrid silencer package. They Hybrid Elbow silencers are bolted to each side of the alternator (only one side visible). Cooling air is inducted through the horizontal opening, into the alternator, and heated air discharged downward to inhibit re-circulation. 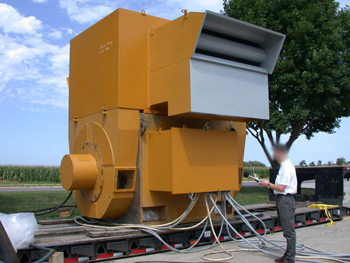 Depicted is the acoustic test for the completed alternator package. ASI Aeroacoustic hybrid silencers brought the system acoustic performance 3-dBA under the established criteria. Empirical aerodynamic tests validated CFD modeling and production skills. Based on acceptance testing, eight (8) more sets were ordered.